Heat caramels and water in a small saucepan over medium-low heat until melted, stirring often. Meanwhile, cut both apples in half and remove the stem. Then use a spoon or melon baller to remove the seeds and core of the apples, leaving about 1/4 inch or so of apple flesh, to create the apple cup. Using a pastry brush, immediately brush the inside of the apple cup with lemon juice. Repeat with remaining apple slices. After the apples have rested for at least 2 minutes, use a paper towel to pat the insides of the apple cups dry. 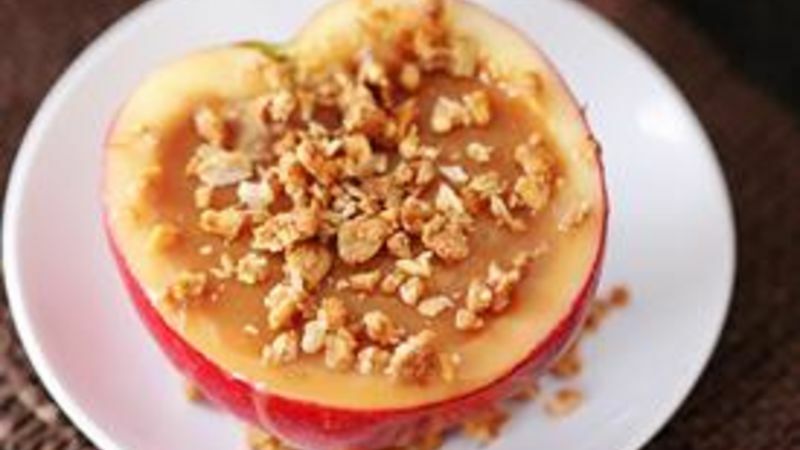 Pour the melted caramel inside each apple cup, and then sprinkle them with the granola crumbs. Serve immediately if you like the melted caramel, or refrigerate them to let the caramel harden again. Note: If you let the caramel completely harden, you can slice the caramel apples into wedges with the caramel in the center! A fun new twist on caramel apples that are easier to eat and even more delicious! ‘Tis the season for caramel apples! But as beautiful as classic caramel apples may be, I’ve admittedly avoided them for years because it is so hard to bite into them! And then they would fall off the stick, and my hands would be covered in sticky caramel, and….well, not my classiest moments. So I was super excited about the idea of trying to make these Inside-Out Caramel Apples. They are super easy to make, and I love that you can control as little or as MUCH caramel as you’d like with each bite! For some extra crunch and cinnamon, I also topped them with some sweet granola, which I loved. The best part is that these are easy to bite into with melted caramel. Or you can refrigerate and then slice them once the caramel has hardened. Or you can even just be an adult and enjoy them as a dessert with a knife and fork if you’d like….which I may have admittedly done. And thoroughly enjoyed. However you serve them, everyone will love these Inside-Out Caramel Apples! Here’s how to make them! …then mix them with 1 ½ tablespoons of water, and melt over medium-low heat to make caramel sauce (stirring constantly). YUM. Then take your apples and slice them in half. And then use a melon baller (which I didn’t have!) or a spoon to hollow them out to make “cups”, leaving about 1/4” thick cup remaining. Brush the exposed insides of the apple with lemon juice to keep them from turning brown, and then after a few minutes pat them dry with a paper towel so that the caramel will stick. Then spoon in that ooey gooey delicious caramel sauce. …and sprinkle them over the top for a nice sweet crunch. …and just begging you to give them a try. Happy caramel apple season!! !